I keep a photograph from 2012 in one of my offices. It’s a very special picture to me. It was taken at Homestead after we won the Cup series. Everyone in the photo — probably about 50 people — is standing on the championship stage. Some are family. Some are over-the-wall guys. Some are manufacturer reps. Some are sponsor reps. Some are from Penske. Of all the people in it, probably about 35 or so played a role in winning the championship. EVERY TIME I SEE THIS PHOTO FROM 2012, A LOT OF DIFFERENT EMOTIONS HIT ME. Every time I see that picture, I can’t tell you how many different emotions hit me. The image captures a moment in time that I would never have even imagined as a kid. It reminds me of how much has changed over the past 20 months or so in terms of our team, and the people who are part of it. 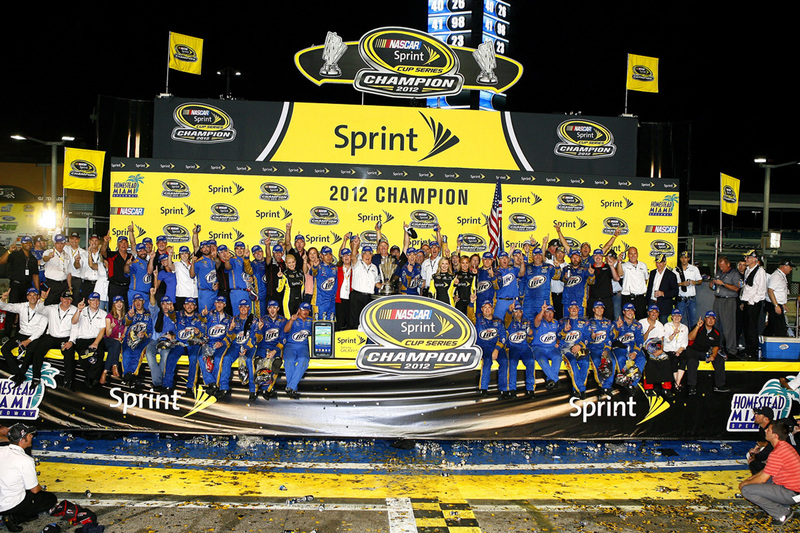 And as we get set to begin the Chase, it makes me think of just how much winning another championship would mean to me. Michigan, where I grew up, wasn’t (and still isn’t) a hot bed for racing. That always struck me as a little strange, given the history of the automobile and so forth. But no one, including me, has ever really associated Michigan with NASCAR championships. When I was a kid, our family ran what was essentially a middling truck team. That was the family business. I always wanted to be in racing, but my dream — and I really mean this when I say it — was to drive and race for my family, and keep the truck team going. I didn’t dream about winning a Cup championship — not because it wasn’t cool, but because the Cup series was so far removed from my perception of reality, I never thought there was the slightest possibility I could be part of that in any way. I thought I might win a truck race someday, and that maybe if I did that, I could eventually win a truck championship of some kind. Mostly, I just wanted to keep my mom and dad employed, and take care of them as they got older. That was my dream. As I’ve written before, that dream collapsed in my early 20s. My dad got sick. The family team lost its sponsor. I tried to take over as the team’s driver. Everything fell apart, both for me and my family, too. Understand: When I started trying to drive in the Nationwide and Cup series, it wasn’t about achieving some childhood dream of being a NASCAR driver. I was at rock bottom. It was about making a living. It was about surviving. Where I came from and how my racing career started have a lot to do with why winning a second championship is so important to me. When I walked in the door of JR Motorsports in 2007, they had one Nationwide car. Literally. The driver before me wrecked every car they had. They were 15th or 20th in points, which for a fully-funded Nationwide team, was awful. In summer of 2008, I won my first NASCAR race. At the time, I thought, “All right. This is good. I’m probably going to keep my job for a few more months at least.” The next season, we won two races, and JR Motorsports finished third in the series. We won four in 2009, contended for the championship, and finished third again. It’s not often in life that you’re given a chance to see that you didn’t dream big enough, and an opportunity to do something about it. But that’s what was happening as the 2009 season came to an end. I saw the growth and potential I had as a driver, and it made me hungry to find my limits. I started to think that winning a championship in the Nationwide series was a real possibility. 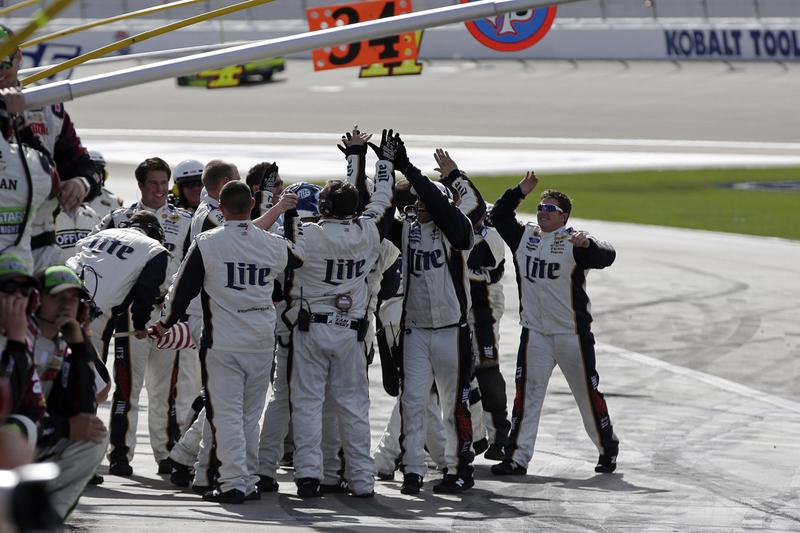 And after I joined the Penske organization and we won the Nationwide Series in 2010, winning a championship in the Cup series started to seem possible. It kind of reminded me of “Forrest Gump,” when Forrest starts running from his house, then across Alabama, and eventually across the country. The funny thing is this: even though I was having success, a lot of the time, I didn’t feel like I belonged. I felt like an outsider. I’m sure part of it was in my head. Part of it was probably where I’d come from, literally 700-plus miles from the heart of NASCAR. Still, I couldn’t help feeling like one of the Bad News Bears a lot of the time, unable to find a place to fit in. In 2009, when Hendrick Motorsports decided to keep Mark Martin as a driver and I lost my Cup ride, there was a logical reason for it, but it still hurt. There are two ways to quiet those types of people. The first is to ignore them, which is certainly a virtue, but not one I’m particularly good at practicing. The other is to win another championship. At the same time, winning another championship is about more than just feeling like I have the respect of the racing community. It’s about everyone else who’s gotten me here, and who I’m working with to try and reach the pinnacle of NASCAR again. To a certain extent, a big part of honoring the people who comprise your team, at least for me, is doing my job. And to me, doing my job is going out there, doing everything I can not to hurt the team, and not screwing up. I take pride in driving well — don’t get me wrong — but I don’t get overly joyous about that part of things. What gives me joy is being a part of that collective effort, seeing the other guys on our team in victory lane, and knowing that I was part of the group. That’s the high of winning. That’s the high of being a champion. It’s being a winner many times over in a lot of ways. You appreciate your teammates more and more. You think of how lucky you are to have them. And you don’t want to let them down. Winning a championship makes you feel like you did your part to earn the support of those elite people around you. That’s an incredible feeling. BEING A WINNER GIVES YOU A DEEP APPRECIATION FOR ALL THE PEOPLE WHO WORK HARD TO HELP YOU GET THERE. When I think back to that photo of Homestead that I mentioned earlier, there’s a sense of sorrow because so many of the people that were with our team in 2012 have moved on. Then there’s the other side of that: new guys have come in and replaced them, guys that are just as eager to win as we were two years ago. How excited and happy would I be for them to have that same opportunity to take that picture? How excited would I be to share that stage with them? In the history of NASCAR, there’s never been a Cup champion at the driver level who has had championships in all three series. My goal for this year — and it sounds a little bit ludicrous, but it’s becoming closer and closer to a potential reality — was to win all three championships: Truck as an owner, Nationwide as a participant with Roger Penske at the owner level, and Cup as a driver. That to me would be the ultimate accomplishment. We have an incredible shot to actually pull it off. That’s just one example of my final motivation for wanting to win a second Cup title. I want to give back to the sport in every way that I can. I want to be a leader and an innovator. I want to give back to the sport in every way that I can. I want to be a leader and an innovator. To feel good about the opportunity I’ve been given and that I’m doing right by it, I need to do more than just win a race, or win a championship. As a professional, the doors that winning opens allow me to feel good about myself personally. When I can do something to improve the sport, when I can do something that improves NASCAR for our fan base, at that point, I feel good about the opportunities I’ve been given, and that I made the most of them. I didn’t do the best job with the crown back in 2012, but looking back, even if I had, I’m not sure how much I would have been heard. The reality was that we had a five-time champion in Jimmie Johnson, a four-time champion with Jeff Gordon, a three-time champion with Tony Stewart, and Dale Jr., the most popular driver in the sport. At best, I was fifth in line. Winning a second championship isn’t getting me to the top of the ladder, but it will get me a lot closer. I desperately want to be there. Not out of some sort of ego trip. The personal accomplishment of winning a race — or even a championship — isn’t that significant to me anymore. It’s not about me alone. I’m incredibly privileged to have had the opportunities that I have, to have the team that I have around me, to have sponsors who do what they do for me, and to have fans that care about me. I realize that each and every time I get in the car. It was a dream to be successful, and it’s still surreal to me sometimes that I’ve been a Cup champion. It’s so much more than I thought I ever would accomplish. And yet there’s so much more I want to accomplish now.